We are living in the digital world. Business is changing so fast by the disrupting technologies. HR is now requested to transform accordingly. What will the future hold for HR? How will digitalization and Industry 4.0 impact HR and Talent Management? What local Business and HR perspectives are now? Join the 2nd edition Talent Management Vietnam, taking place 12th-13th October, 2017 at Sheraton Saigon Hotel in Ho Chi Minh City, Vietnam. This exclusive 2-day conference is designed to provide unrivalled access to Business, HR and Talent Leaders from Multinational and Big Local Companies in Vietnam, Asia and the World, encourages participants to discuss solutions for current challenges and explore ideas shaping tomorrow's business landscape. Benefit from a content-driven, fresh and interactive agenda featuring high caliber Gurus and practical Speakers capable of offering real insight. You take options to attend full two days conference including 4 sessions or participate each session upon your needs. WHY YOU MUST ATTEND THIS TALENT MANAGEMENT SUMMIT IN VIETNAM? Interactive Group Discussion: How HR and Talent Management Can Drive Engagement in Vietnam Talent War? Interactive Group Discussion: How to build a happy and positive work place? 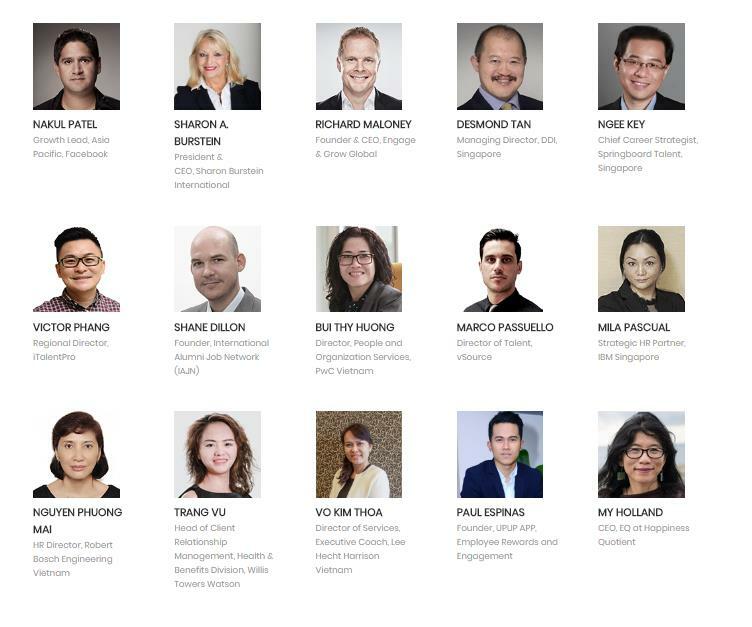 In parallel to the interesting main sessions of Talent Management Vietnam 2017 Summit taking place at Sheraton Saigon Hotel on 12&13th October, 2017, there are some free sessions conducting by honor speakers from leading global companies such as Facebook, Lee Hecht Harrison, and Engage & Grow Global. These free sessions can help you broaden your horizons and provide you with the own real insight and experiences from our most respected and highly talented speakers in building talent management strategies which is always very remarkably valuable for your own business. HR Media is a private corporation registered in Vietnam with Head Office based in District 1, center of Ho Chi Minh City. We specialize in dedicated Leadership and Talent summits and workshops providing an array of thought-leading Business Leaders and HR Leaders discussion, up-to-date management information and practical HR training and sharing to the corporate management and HR professionals in Vietnam and the neighbor countries in the South East Asia region. In Vietnam and SEA Region, we are a pioneer in the field of human resources media and communications. The key mission of our company is to connect together C-suit level experts, key industry leaders and influential HR professionals through our events, products and services. The end of this connection is to leverage and empower the HR in the organization and to support both HR Function and Business Management to understand each other better and deeper in order to make the business, people and organization more effective and efficient.